How was the German test? 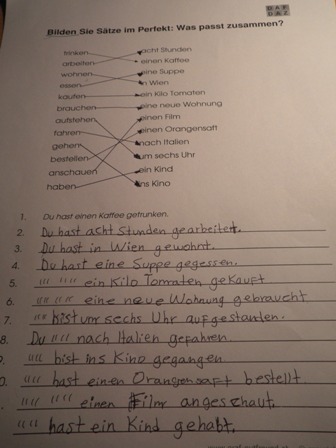 I took the level test in Deutsch Akademie some days ago. Althoug it was difficult, I had few mistakes. My teacher recommended to me to review them for improving my skills. I think it was good to study hard (a full weekend) for doing a good job. 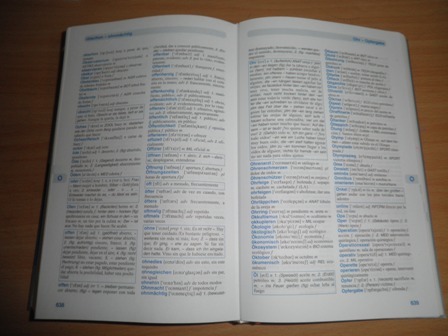 It was also very useful to practice daily the examples given in class and review them periodically, because German is a difficult language that it needs a permanent learning. That’s why I really believe that it was the best choice to study an intensive course of three hours a day. Otherwise, my learning it would have been slower and I would have forgotten easily the issues learned. I really feel satisfied with the results of my test and with the knowledge I have acquired during this month. This entry was posted in Allgemein on 30. September 2009 by Maria. This is how pretty Vienna is. This is a building near the Hunderwasserhaus. Ich wohne in Klosterneuburg. Und ich mag in Heurigen essen. Heurigen are restaurants owned and operated by wine makers. They have cheap wine, and a good selection of meats and pickeled salats. My favorite Heurigen is on Agnes strasse in Klosterneuburg. I enjoy the atmosphere at Heurigen because we can eat outside, sometimes under a canopy of grape vines! This entry was posted in Allgemein on 30. September 2009 by Brittany. It is difficult to say which place or places you shouldn’t miss in Vienna. As I explained some days ago, there are so many interesting places that the selection depends on your personal preferences. For example, if you are a fanatic of art, you cannot miss absolutely visiting all the main museums and galleries of the city. Each of them has something different to show to the visitors. The same we could say if you like music very much. Vienna has various possibilities that you will not have enough time for attending all the events and spectacles. That’s why Vienna is called the city of the music. For lovers of culinary traditions, there are so many places to go, that it is difficult to choose the best restaurant or Cafe in Vienna. Each of them has something special to offer that they can satisfy to the most demanding customers. In my case, as I like sports and enjoying of sun and warm weather, I think that my favourite place is the Danube River. Definitively, you cannot miss of visiting it, particularly in spring and summer. The natural environment is so quiet, that you won’t want to finish the visit. I like the forest and trees that surround the river. In some places of the “Donau Park” (Danube Park) it would seem that you are in the Paradise. In this fantastic place, the possibilities for all kind of outsider sports are enourmous (walking, jogging, cycling, skating, swimming, sealing, etc). Now I understand why Strauss composed his famous Vals “Blue Danube”. This entry was posted in Allgemein on 29. September 2009 by Maria. We have started our fourth week in Deutsch Akademie and I am very excited. 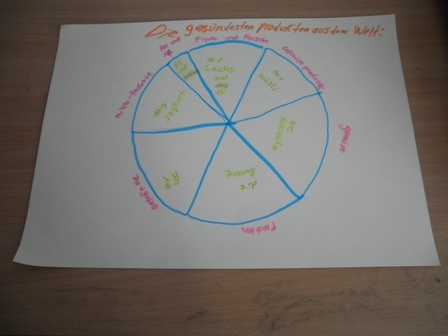 Today we have made the funniest exercise in class, which consisted in inventing one or various healthful food products. Our group made a nutritional pyramide where we showed some of these products, as vegetables, fruits, products with proteins and milk products. Other groups invented products, such an exclusive wine and special cakes. We enjoyed very much. We could practice our conversation skills much more. I have been placed in level 1B since last September, when I started studying German in DeutschAkademie, and I hope to continue the next level because I have learnt a lot. As I told before, I am able to talk easily and, at this stage, I could say that I understand every word my teacher and class mates speak. I am really satisfied. This entry was posted in Allgemein on 28. September 2009 by Maria. So, I have completed three weeks of my german course. I can see that I am improving every day, but I also see that I have a long way to go! Lisa (the teacher) is great. I know that her job is tough — teaching a language to people who do not know the language … entirely in German. Sometimes at the end of class, we play a review game. She makes cards, each one asking us to conjugate a verb, determine the nomativ and the akkusativ of a noun, or determine the plural form of a noun. Although I get the gender wrong almost every time I get a noun card, I still enjoy playing this game. It is a great help to helping us determine where our weaknesses are. 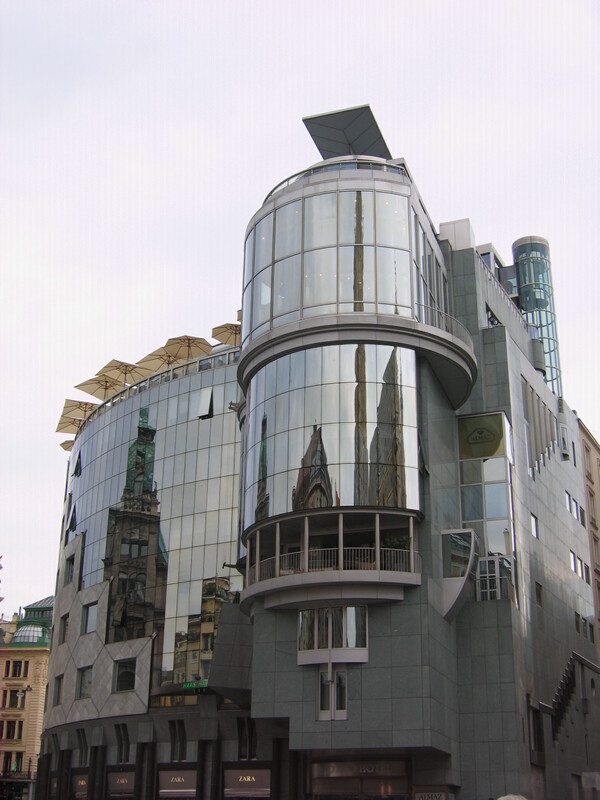 Above, I have a picture of Haas Haus on Stefansplatz. I think this building is really neat looking … and there is a Zara inside of it! This entry was posted in Allgemein on 28. September 2009 by Brittany. As I mentioned before, Vienna has so many interesting places that evening locations are not the exception. You find food from various countries and styles, but definitively the Austrian food is excellent. Besides the famous Heurigers (typical restaurants), I really recommend the “Zwolf-Apostel-Keller”, Twelve Apostles Basement, a subway medieval building where you can find most of the Austrian food and with convenient prices during all the year, but particularly in winter, when you can drink hot beverages and always a good wine exclusively made for the restaurant. 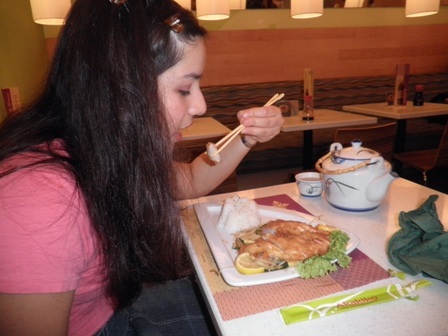 I also like the japanese food and in Vienna there are some excellent restaurants. 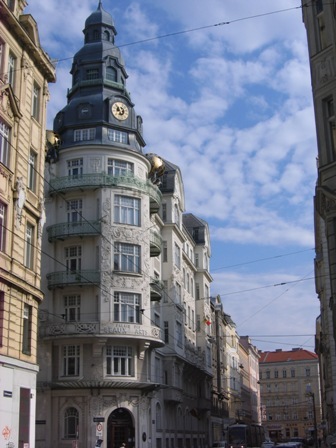 I prefer one in the heart of town, near Stephansplatz, Akakiko restaurant, which has convenient prices and good food. For the coffee fanatics you will find a great quantity of cafe shops along the city, but specially in the center. Having made a tour in some of them, I really like “Cafe Central”, in the Herrengasse Street, nice, comfortable where you can drink the best of the best, as the famous “melange” coffee and a delicious “Sacher Torte”, (chocolate cake). The interesting of this Cafe is the fact that you feel time stops and you can enjoy its quiet atmosphere listening piano, reading a dialy newspaper or talking in low voice with your friends. This entry was posted in Allgemein on 25. September 2009 by Maria. Anhand des riesigen Baukomplexes der Hofburg werden wir die Geschichte Österreichs kennen lernen. Wir werden die ältesten Bauteile der Hofburg besichtigen bis hin zu jenen Bauten, die in der Zeit von Kaiser Franz Joseph und Kaiserin Sissi gebaut wurden. Wie mag das Leben in der Hofburg wohl ausgesehen haben? Das Kuturprogramm findet jede Woche statt und ist für Schüler der DeutschAkademie gratis! Möchtet ihr auch außerhalb des Kurses Deutsch lernen und mehr über Wien erfahren? Habt ihr Lust, neue Freunde mit denselben Interessen zu finden? Dann registriert euch noch heute im 3. Stock der DeutschAkademie für das Kulturprogramm! This entry was posted in Allgemein on 25. September 2009 by Vera. Ther are many things that you should not miss during your stay in Vienna. One of which is the Belvedere. The palace has a small garden, which is nice to walk around. But, the best view of the gardens is from the 2nd floor of the upper Belvedere. There are two parts the the museum. And, the upper part houses work by Klimt and other Austrian and French artists. In the lower Belvedere, the most impressive sighs are the Marble Room and the Golden room. In addition, the orangerie has modern artwork. It is a small part of the museum, but intriguing to visit. This entry was posted in Allgemein on 24. September 2009 by Brittany. After almost three weeks of my German Course, I could say that I continue advancing in learning German. We had our first test and, although it was a little difficult and I had some mistakes, I feel I have improved much more. We have learned to conjugate verbs in past and present perfect, doing each time more gramatical examples. Moreover, we can distinguish between regular and irregular verbs. For increasing our vocabulary and enhancing our conversation skills, we have discussed about the different types of food around the world, specially the typical food from the countries of my classmates and today we have talked on some common diseases. Our teacher always helps us in every doubt we have and has explained specially well a grammar rule for distinguishing the conjugation between a regular and irregular verb. I couldn’t say which excercise has been the most helpful for me, because I consider that every exercise is important for improving my German, but maybe those relating to past and present perfect times and also those for conjugate regular and irregular verbs have helped me a lot. This entry was posted in Allgemein on 23. September 2009 by Maria. In Wien, ich mag in die Museen gehen und in die Heurigen gehen. Ich möchte den Stephansdom besuchen. Wöchentlich spiele ich Fußball mit meinen Kollegen. Am Sonntag spiele ich Lacrosse! Nächstes Wochenende besucht mich Darrell. Er wohnt in den USA, aber er ist in Frankreich für eine Konferenz. Danach ist er ist hier! This entry was posted in Allgemein on 23. September 2009 by Brittany. Vienna is a city with so many interesting places for visiting that one month maybe could be not enough, but at least it is a good time for knowing the most important monuments and sights. 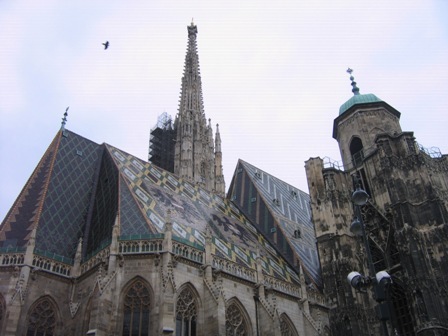 Although it doesn’t matter the season you arrive to Vienna, because, as I explained before we always find activities to do along the year, it is good to visit first the main churches and monuments. As Vienna has an excellent public transportation you can get the subway or the tram for reaching these places. The majority are in the down town, in the center of the city. The first one, the symbol of the city, St. Stephan Cathedral, which is one of the most important religious gothic monuments in Europe and is located in the square of the same name, Stephansplatz. From here, you can start your journey to other monuments and places, depending on your time in Vienna. On a good Sunday and if you like walking, going through Graben, the shopping avenue, and taking Kohlmarkt, you arrive at the Imperial Palace (Hofburg). Its main entrance, called Michaelertor, was built at the end of the nineteen century.You cannot miss of knowing the imperial rooms, the Sizi Museum and the Treasure Chamber, which have most of the imperial history of the Habsburg Emperors. These museums are enough for one day. The following days you can continue your travel through the Heldenplatz (Heroes Square) and the New Imperial Palace, visiting the National Library and the Ethnology Museum. From this place you arrive to the most famous avenue since the imperial age, the Ring. If you are not tired and have enough time, you can visit the “Twins Museums”, the Museum of Natural History and The National Museum of Art, which has the fourth most important painture gallery in the world. Between them, there is the monument to Maria Theresa Empress. From there you can reach in some minutes to the Opera, one of the most famous buildings in the world. The other famous places are the St. Charles Church, some minutes from the Opera, the most important Baroque Church of Vienna, and from there you can take the tram D to visiting other treasure: the Belvedere Palace, built for Eugene Prince, where you find other interesting galleries and of course its fabulous gardens. These treasures deserve one day at least for visiting. 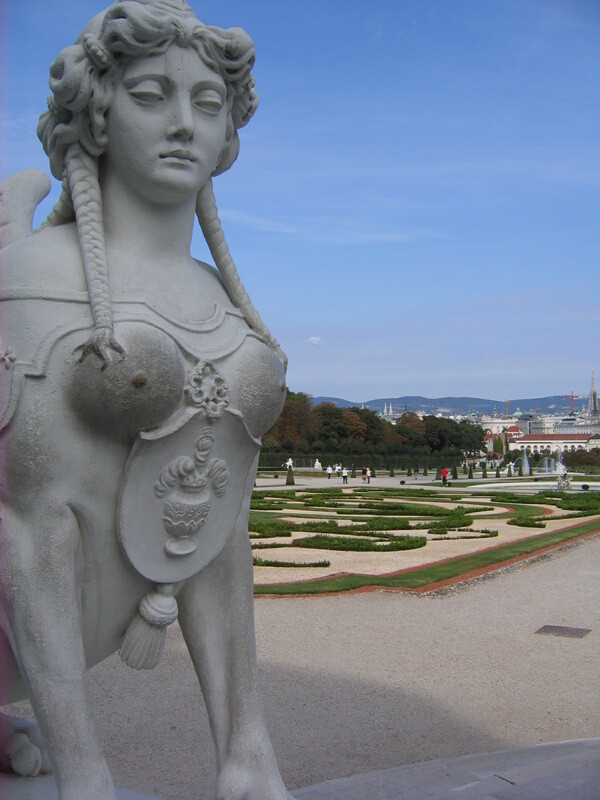 Other weekend you can use it for going to the famous Summer Palace: the Schönbrunn, the Yellow Palace of Maria Theresa, which deserves at least one day for visiting its enormous gardens, museums and zoo. Finally you can take other weekend for going to the Town Hall (Rathaus), with its neo-gothic style, the Parlament, (helenistic style), representing the democracy, although it was built during the imperial time, the Burgtheater and the University. On the weekdays, you always will find places and typical restaurants to visit, particularly in down town. While you traverse the narrow streets in the center, don’t forget to attend some famous art galleries I mentioned some days ago: Albertina, Liechestien and Leopold Museums, very famous around the world for their fantastic art treasures, from the Middle Ages to the Modern. As I told before, one month is not enough, but if you are anxious to know more places and if the wheater is good, you can enjoy in the Danube Island, the Prater Park and the Stadt Park, the most known places for sports and relaxing time. This entry was posted in Allgemein on 22. September 2009 by Maria.